Joie de Kitty: Happy Escalade! Wait. You don't know what Escalade is? Once upon a time, there was a man named Charles-Emmanuel I, Duke of Savoy. He was a very greedy man, and he wanted to conquer Geneva. At the time, Geneva was a prosperous city of about 12,000 people, and the Duke of Savoy wanted to make it his capital (and crush Protestantism while he was at it). So he organized an army of 2,000 men, and in the middle of the night from the 11th to the 12th of December 1602, they began their invasion. Now, the word "escalade" comes from the French verb "escalader", which means "to climb". The reason this night is called l'Escalade is because the Savoyard soldiers set up ladders all around the ramparts protecting Geneva so that they could climb the wall and get into the city. About 200 soldiers managed to get into Geneva before two Genevan soldiers heard them and sounded the alarm. The warning bells at the cathedral began to ring, and the people of the city poured out into the streets in their nightshirts to fight the invaders. 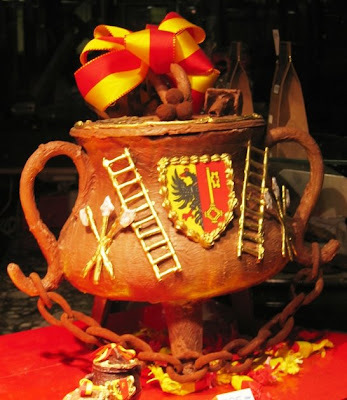 Legend has it that a woman called la Mère Royaume (Mother Kingdom) had an enormous cauldron of vegetable soup cooking over the fire and threw it out the window at the invaders in the street below, killing one and injuring many more. 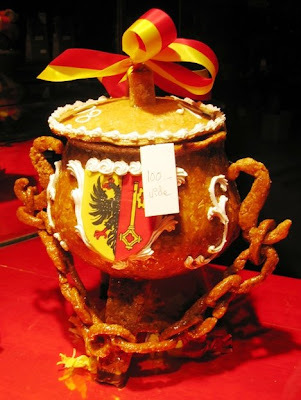 Thanks to her, the Genevans won the battle, which is why we buy chocolate cauldrons (called "marmites") full of marzipan vegetables to eat at Escalade. The candy medallion with the crow and the key on the front of each marmite is Geneva's coat of arms. 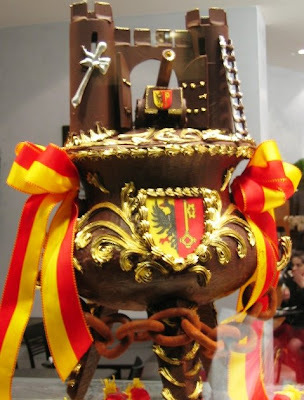 Most marmites also have the date 1602 written across the top in chocolate covered in gold leaf. When it comes time to eat the marmite and the candies inside, the oldest and youngest member of the family join hands, proclaim Ainsi périssent les ennemis de la République! and bring their fists down on it to shatter it. Way too much fun. Lots of festivities going on over the weekend... I'll be back with a full report!